Atlantic recording group Matchbox Twenty has announced the release of their new album ‘North’, scheduled to arrive everywhere on September 4th. 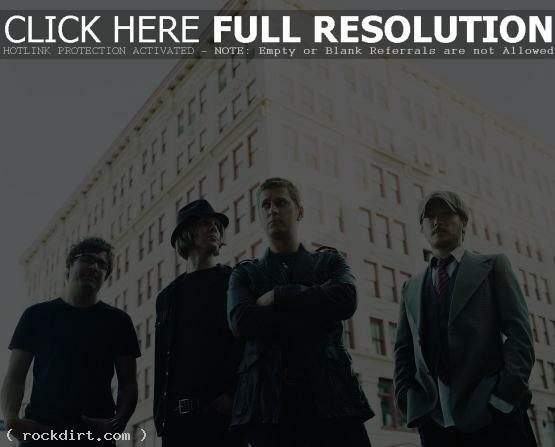 ‘North’ marks Matchbox Twenty’s fourth full-length studio recording and first all-new album in a decade. “The title refers to us finding our way,” guitarist Paul Doucette said. “We went into this record with a lot of material. Many different songs that could have taken us in many different directions. It sort of overwhelmed us for a bit. But, at a certain point, we figured it out. We figured out where North was.” The album’s first single, ‘She’s So Mean’, is slated to be unveiled in June. ‘North’ sees Matchbox Twenty driving their pop-rock sound further forward; magnifying the indelible melodies, crafty lyricism, and glorious hooks that have always defined their multi-platinum body of work. The band—Rob Thomas, Paul Doucette, Kyle Cook and Brian Yale – lived together last Summer in a house in Nashville, where they all collaborated on the new material before once again joining forces with the Grammy Award-winning producer Matt Serletic at his Emblem Studios in Calabasas, California. The result features songs like ‘Overjoyed’ and ‘Put Your Hands Up’. The segment, also featuring comments from singer Rob Thomas, has since been removed at FoxNews.com. 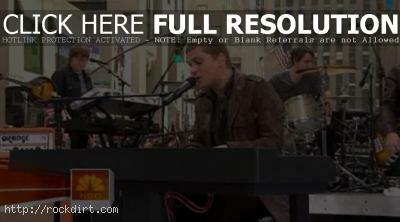 Matchbox Twenty visited ‘Today’ on Monday (October 8) at Rockefeller Plaza in new York City. Watch performances of ‘Bright Lights’, ‘If You’re Gone’, and ‘How Far We’ve Come’, and an interview with Matt Lauer, via YouTube below. Rob Thomas told Billboard.com that the new matchbox twenty album ‘Exile on Mainstream’, due October 2nd via Atlantic, could include as many as six new cuts produced by Steve Lillywhite, as well as 11 prior hits. “This is different than any record we’ve made, and different than my solo record,” said Thomas, who had never collaborated on the songwriting with his bandmates. “We got together for a week at my house and we all had song ideas, but they didn’t sound like what we wanted to play together. Between that vibe and working with Steve, it’s a much more raw, energetic, live-sounding record than we’ve done in the past.” Yahoo.com has since removed the full article. Rob Thomas of matchbox twenty and Bono of U2 attended Cinema Society’s Screening of the movie ‘Zodiac’ held at the Tribeca Grand Hotel Screening Room on Wednesday (February 28) in New York City. Check out pictures from FilmMagic (premiere / afterparty), RexFeatures, and WireImage (page1 / page2). Fuel’s Carl Bell is on a list of rockers that includes matchbox twenty singer Rob Thomas, Three Doors Down singer Brad Arnold and SR-7 singer and Bo Bice collaborator Mitch Allan, who are writing tunes with ‘American Idol’ season five finalist Chris Daughtry for his forthcoming debut album. “I’m writing on my own, as well as getting together with some great artists and songwriters who I’ve always respected and who have expressed an interest in collaborating with me,” Daughtry said in a statement, according to MTV News. “It’s been thrilling to approach this album as a new canvas, with the experience of the show and such an incredible year to draw on.” Read more. Carmen Electra, Panic Channel guitarist Dave Navarro, No Doubt singer Gwen Stefani, Joel Madden of Good Charlotte, Pamela Anderson, matchbox twenty singer Rob Thomas, The All-American Rejects, and The Transplants drummer Travis Barker were on hand for the 33rd Annual American Music Awards at Shrine Auditorium in Los Angeles, California on November 22nd. Check out pictures from WireImage and FilmMagic (arrivals1 / arrivals2 / show / pressroom / audience / backstage / afterparty). Dave Matthews Band, Def Leppard, Kaiser Chiefs, Linkin Park, Maroon 5, and matchbox twenty singer Rob Thomas performed at the Live 8 Philadelphia concert on July 2nd at the Museum of Art in Philadelphia, Pennsylvania. Check out pictures from WireImage, FilmMagic (show / pressroom / afterparty), and GettyImages. U2, Bruce Springsteen, Buddy Guy, Steven Van Zandt, Bo Diddley, Martin Chambers and Chrissie Hynde of The Pretenders, Eric Clapton, Mick Fleetwood, Stevie Nicks, Bono, Jon Bon Jovi and wife Dorothea, and Rob Thomas of Matchbox 20 were amongst the stars on hand for the 20th Annual Rock and Roll Hall of Fame Induction Ceremony on March 14th at Waldorf Astoria Hotel in New York City. Check out pictures from GettyImages (arrivals / pressroom / show) and RexFeatures. Foo Fighters frontman Dave Grohl, Franz Ferdinand, Velvet Revolver, Paul Stanley of KISS, Rob Thomas of matchbox twenty, and Kid Rock were on hand for the 2005 Clive Davis Pre Grammy Awards Party at the Beverly Hills Hotel in Beverly Hills, California on Saturday (February 12). Check out pictures from RexFeatures and GettyImages (arrivals / inside).